The annual “Balikatan” exercises between the Philippines and the United States has helped maintain stability in the Pacific Region. 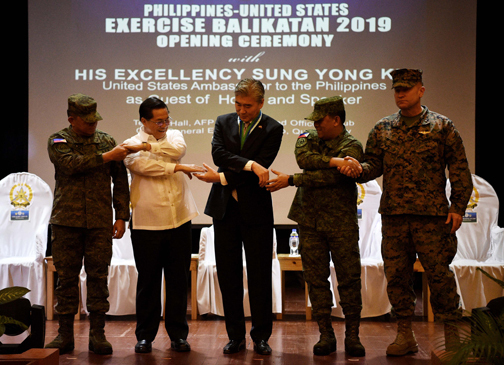 “Exercise ‘Balikatan’ has become one of the premier military training events in the Pacific Hemisphere and has helped us to maintain regional stability, uphold international norms, combat violent extremism, alleviate human suffering, and much more,” said US Marine Corps Brig. Gen. Christopher McPhillips, also the American exercise director for the annual military maneuvers. This year’s “Balikatan” exercises formally opened in a ceremony at the AFP Commissioned Officers’ Club at Camp Aguinaldo, Quezon City Monday. “Balikatan”, which means “shoulder-to-shoulder” in Filipino, symbolizes the partnership between the Armed Forces of the Philippines and US Forces. Around 4,000 Filipino, 3, 500 American troops will be taking part in the exercises which will run from April 1 to 12. The exercise also includes the participation of 50 members of the Australian Defense Force for humanitarian and civic assistance projects and special operations forces training. Philippine and US forces will conduct counter-terrorism training, amphibious operations, live-fire training, urban operations training, aviation operations, bilateral planning, subject matter expert exchanges, and humanitarian and civic assistance projects throughout Luzon. “The 35th iteration of Exercise Balikatan is aimed at improving both AFP and US Forces’ inter-operability through trainings that are focused on mutual defense operations and counter-terrorism. The goal of such is to enhance both militaries’ employment of forces and assistance in the event of crises that threaten the safety and security of the nation,” Philippine exercise director Lt. Gen. Gilbert Gapay said. AFP chief-of-staff Gen. Benjamin Madrigal, in an ambush interview, said the exercises will help participating troops keep abreast in the latest technologies and equipment pertaining to defense. “’Balikatan’ focuses on maintaining a high level of readiness and responsiveness, and enhancing combined military-to-military relations and capabilities. Trainings included in the annual exercises also help in reinforcing maritime security, territorial defense capabilities, and responsiveness to humanitarian disasters. Philippine and US military collaboration has served as a cornerstone for stability in the Indo-Pacific region for decades. Both militaries share a continuing interest in strengthening the longstanding alliance.